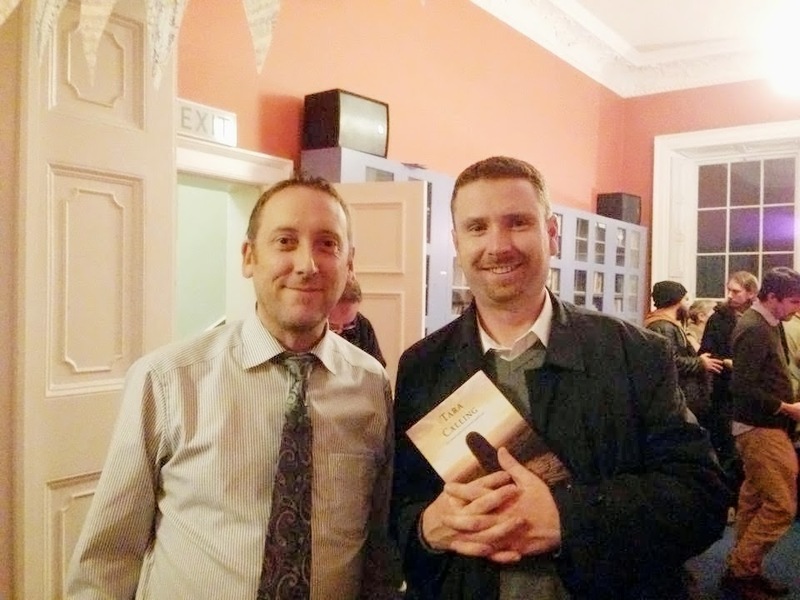 Here is the text of my speech at the launch of Carmel Diviney's book 'Tara Calling' which took place on November 6th 2014 at the Irish Writers Centre in Dublin. Ladies and gentlemen, distinguished guests. It gives me great pleasure to be here tonight to speak at the launch of this very important book. When Carmel asked me if I would say something, I was both honoured and daunted. What would I say? She said “don’t worry Anthony. I have heard you speak many a time so I trust you will say what comes from your heart anyway”. So here goes . . . a little something from my heart. 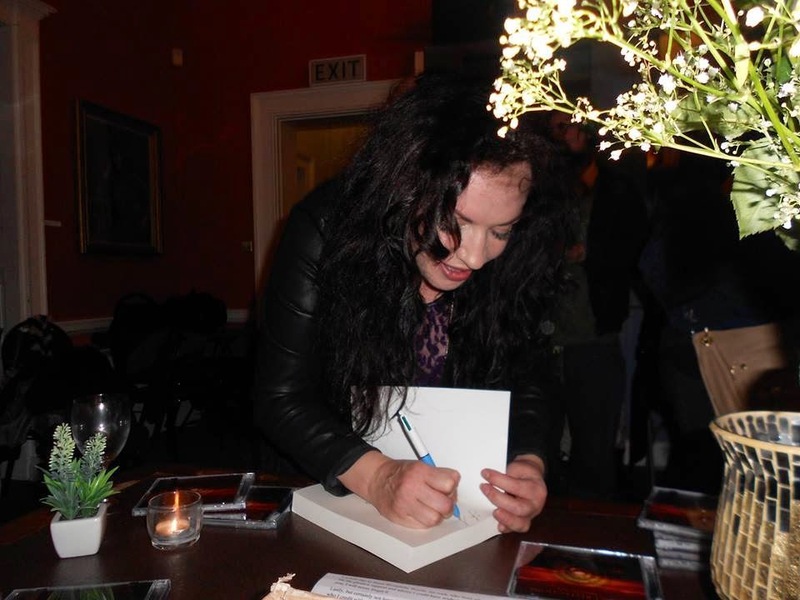 Carmel Diviney signing her book at the launch. As many of you will know, I have written a fair bit about Ireland’s ancient monuments and mythology, and I hold these things as great treasures, treasures not only of a nation or a culture, or a specific race, but treasures of the heart, and of the soul. Am I the only one with this view? Thankfully not. Does everyone hold this view? Sadly not. I have a great interest in the invasion myths, and in the Tuatha Dé Danann. Our whole history, both mythically and in reality, has been one filled with invasions. And those myths continue to resonate today. They are not mere fireside stories of old. These myths are relevant to a great deal of what’s been taking place in Ireland in recent years, in the political, social, religious and economic affairs of the nation. In the Second Battle of Moytura, the Tuatha Dé Danann battled against the Fomorians. The Tuatha Dé were a divine race. The Fomorians were a destructive one. In my opinion, the Battle of Moytura never ended. It is an eternal battle, one which continues to play out today. Over the past 15 years in Ireland, it seems that there was a distinct Fomorian influence manifesting itself in the events and happenings of the country, something that entered into many of the decisions being made on behalf of its citizens. One of these decisions was to route the M3 motorway up the Tara-Skryne valley. But there were many more. During the so-called Celtic Tiger years, we had deluded ourselves as a nation. We thought the Fomorians were dead and gone. Who believes in fairy tales anyway? We somehow came to think that we could own our own home, no matter the cost. We could borrow three, four, even five hundred thousand euros, and more, and not worry too much about repaying it. The fact was that we had jobs and the banks were willing to lend us the money, so who should worry? And we could even throw in a second property in foreign climes as an “investment” or a holiday home. After all, it was only fitting that the Irish, so long deprived of land and property, should now be able to make their nests in such obviously culturally similar places as Cape Verde, Dubai and the Black Sea Coast of Bulgaria. While people obviously had a lot of cash in their pockets, and we had never known a time of such plenty, it should have been blindingly obvious that something was not right. There was a huge amount of development taking place. Huge tracts of land were being given over to housing estates, industrial estates, retail parks, apartment complexes, and indeed roads. The plan seemed to go something like this. Let’s build thousands of homes in the commuter belt and people can buy ridiculously expensive homes that they will never get to spend much time in, because they will be racing up and down the new road network to jobs in Dublin from as far away as Cavan, Longford and Laois, and when they get home they will go to their evening job to help pay off the two grand a month repayments on that 40-year mortgage, and they might never get the chance to start a family, or live a life, or engage in their local community. Ah sure we’ll build a few schools and playgrounds and that’ll keep them all happy. During my time as Editor of the Drogheda Leader newspaper from 2003 to 2007, I wrote about several controversial plans, on which I had considerable personal reservations. One was called the Northern Environs Plan, which in the cold light of day and on “mature recollection” could probably be fairly construed as a plan whereby the local authorities would facilitate developers to make millions creating a vast agglomeration of houses against a pretext of building a much-vaunted and long-called-for access road to Drogheda Port. There was another similar plan for the south side of the town, which, if memory serves me right, envisaged the construction of up to 10,000 homes, and a football stadium. Now that was crazy, especially given that there weren’t even 10,000 homes in the borough of Drogheda at that time. We would have a town of 70,000 inhabitants, the local authority told us. Back then, we had less than half that population. There were vague plans for schools and other community facilities, but the first things to be built, of course, would be the houses and the roads. Then there was Drogheda Port itself. Having heard local politicians banging council chamber tables for years and years calling for this port access route, without success, we then learned that Drogheda Port Company might not need the road after all because they were planning a new deep sea port somewhere along the east coast. At one time, 11 different sites along the east coast were being considered for this new deep sea port. And what was the one that was ultimately chosen? Bremore. Yes, the one with the megalithic passage-tomb cluster on it. Of course. Sure where better? Anyway, who would care about few auld mounds? Sure everyone knows the Tuatha Dé Danann had gone away to Tír na nÓg and only the hippies and the tree huggers gave a damn about fairy tales and fairy mounds. Everyone else was busy working for Celtic Tiger Ireland. Inc. (Trademark!) Right? Wood Quay protests? Bunch of hippies. Glen of the Downs? Definitely the tree-huggers. the launch of 'Tara Calling' in Dublin. And then the M3 show rolled into town. And those of us who were immune to the spell of the Fomorians were flabbergasted, disgusted and astonished that anyone in their right mind could consider routing a motorway through the Tara-Skryne Valley. But the M3, and specifically the crazy plan for its route through that historic valley, became a grand symbol of the insanity and incongruousness of the Celtic Tiger era. Nothing was sacred. And anyone who dared to suggest that a centre of historical and cultural significance, such as this, which has not many equals in other parts of the world, should halt the wonderful and triumphant march of progress, was clearly nothing more than a hippie or a tree-hugger with too much time on their hands. I can tell you, ladies and gentlemen, that the late Seamus Heaney was no hippie. And he deplored what he called the “ruthless desecration” of that sacred landscape that the M3 would bring. The hundreds of academics, archaeologists and conservationists from around the world who wrote to the Irish Government condemning the plan and calling for a rethink were also ignored. Obviously the hippies had infiltrated the upper echelons of the fine educational institutions of the world. While we all stood with mouths agape at the horrendous disregard for culture that seemed to have enveloped Fianna Fáil and their cohorts, and what’s more their utter arrogance and boldness, the plan gained momentum and it was clear we were going to have a fight on our hands. If they ignored all the academics, and the likes of Seamus Heaney, it might have to come down to a stand-off on the turf. And that’s exactly what happened. Astonished by the relentless speed at which this mad project was advancing, and taken aback by the complete disregard for a sacred landscape shown by the government of the time, the protests and direct action began. With the ongoing legal and political battles seeming to prove fruitless, a band of defenders began their effort to attempt to halt the construction of the M3 through the Gabhra valley. 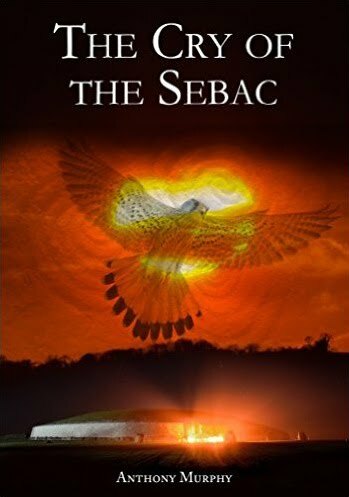 The battle to stop the M3 was the last desperate fight to prevent the tail of the tiger from breaking the strings of the harp, as Heaney put it. But in truth it was to be the last battle of sense against the insanity of that era. And thus Carmel’s book has a very important role to play in the telling of the history of this time to the generations of the future. Those who protested against the routing of the motorway through the Tara-Skryne Valley were made to feel like outcasts, like wasters and degenerates who were blocking progress towards a wonderful prosperous future. But we knew that we had right on our side. And we knew that the fairy tale of prosperity for all was just that - a fairy tale. There was, unfortunately, a dark side to the way the direct action protesters were treated by murky, clandestine and nameless agitators of the Government and the agencies through which it did the dirty work of carving up the sacred landscape. I personally heard a number of firsthand accounts of assaults by agents unknown on protesters. And that’s how it went. People who cared deeply and genuinely about their heritage and the landscape were viciously assaulted by the thugs who were in some cases unidentifiable, and who of course were far removed from the authorities, so that the government could always distance itself from any such murkiness. I’m delighted to have the honour of launching Carmel’s book here tonight. I want to applaud her, and all of those who joined her either in the direct action activities or in related protests and lobbying and publicising this shameful act of cultural vandalism. These were people who were willing to stand up to belligerence and ignorance, and to say no on behalf of many more people in Ireland and in various parts of the world who wanted the project stopped and re-routed. I know there are those who would say some of you didn’t cover yourself in glory. But from what I could tell, the bulk of the aggression came from those incognito Fomorian agents who were trying to force this project through. I’m sure there were times when you wondered if it was worth the battle Carmel. I read the passage where you and several others were arrested and detained at Navan Garda station. That must have been one of the low points for you. But then seeing all your supporters in the courtroom must have reassured you. The uncovering of the so-called Operation Bedrock was proof, if it were needed, that a security and policing policy existed in order to “criminalise peaceful and legitimate protesters, and to quell free speech” in the words of Laura Grealish. You had right on your side. The Battle for Soldier’s Hill and the Battle of Rath Lugh were events that defined the struggle of right against wrong. And that’s why your book is so important. It is a chronicle of the events of the time, from the perspective of the protesters. God knows we heard enough from the pro-motorway lobby in the form of politicians and businesspeople and the media during those mad times. It’s important, for the sake of posterity and for a full record of the story of the M3, that the other side of the story is told. And now it has been told, and it is my earnest hope that enough people become acquainted with it so that we as a nation prevent such madness from taking place again. It’s now 2014. The M3 is long finished. They put some nice tolls on it just to make sure that it’s not busy enough to have been warranted in the first place. They did the same with the M1, and the poor residents of Julianstown who had been campaigning for years for a bypass found no alleviation when the motorway was eventually built. Traffic through that lovely village is now worse than it ever was before the M1 was built. It’s 2014 and still there’s no sign of any movement on a proper rail link to Navan. Of course the M3 somewhat conveniently reduces that need, but if we are to have proper sustainable communities in this country we are going to have to move away from motorways and motorcars towards mass transport. Even better, it would be nice if we could all live and work in our own towns and villages, and enjoy community life a bit more. It’s now 2014, and where are all the bones of the ancestors they dug up from their graves in the Tara Valley? Are they still in a warehouse somewhere? It’s now 2014, and Fianna Fáil haven’t recovered from the disastrous meltdown that started happening to them just as the M3 was completed. Of course, I know lots of you will say that is no coincidence. It’s now 2014, and we’ve all but given away the rights to our oil and natural resources, something that Justin Keating said would be a crime against the Irish people. It’s now 2014, and the government of the day is trying to make us pay for water. The ancestors would turn in their graves, if they were still in their graves. Carmel, I’m delighted to officially launch your book tonight, and I wish you every success with it. Thank you, from all of us, for all of your hard work putting it together. And I leave you with this thought. The widespread folklore about the Tuatha Dé Danann is that they live on, in the sídhe, awaiting the call to return and bring Ireland to glory. The Fomorians will never win the eternal Battle of Moytura. The Tuatha Dé Danann won’t allow it. The Fomorians might have won the battle, but they lost the war. Millmount might not have been built on a Stone Age passage-tomb, a public presentation of archaeological data heard last night in Drogheda. 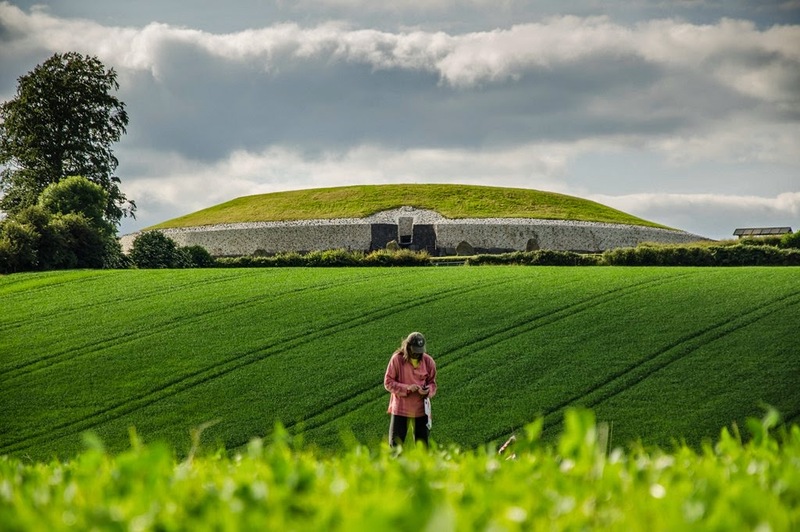 However, one intriguing possibility based on the results of advanced archaeological techniques is that it might perhaps have been built on a clay mound, like a barrow, a type of burial monument dating to the Bronze Age, and therefore later than the likes of Newgrange, Knowth and Dowth. Millmount might have been built on an ancient burial mound. But it's still too early to say for certain what lies beneath the mound of Millmount, if anything. The new data is from the latest phase of the Millmount Archaeological Remote Sensing project, aptly shortened to MARS, because some of the technology being used is out of this world! The presentation was given by Kevin Barton of Landscape and Geophysical Services (LGS), Conor Brady of the Department of Archaeology, Dundalk Institute of Technology, and Brendan Matthews, the Old Drogheda Society Community Historian. The data presented last night was generated using Ground Penetrating Radar (GPR) and Electrical Resistivity Tomography (ERT). The GPR data was taken along eight transects of the mound, and Kevin Barton revealed that the signal "was totally absorbed" by the mound, indicating that it might consist largely of clay. This would seem to rule out the possibility that it is a cairn, built largely of stone, like Newgrange, Knowth and Dowth. There was a possibility of a slight "overlapping of layers" of clay in the mound, but this was by no means definite. The Electrical Resistivity Tomography (ERT) data was perhaps the most exciting. This involves putting stainless steel electrodes into different parts of the mound and measuring the resistance based on Ohm's Law (Resistance equals voltage divided by current). A series of measurements were taken at the base of the mound, just above the modern revetment wall, spaced at 5 metres apart. There were four distinct "high resistance" areas along the perimeter of the base of the mound, with low resistance areas underneath them. Eighteenth century drawings show that Millmount had four towers around its base, and these four areas of high resistance might correspond to the location of those four towers. Four sections of the mound were also measured using ERT, and Kevin Barton revealed results from these measurements which appeared to show a quite distinct area of low resistance at the core of the base of the mound. He said this area of low resistance would correspond in his mind to a large clay mound. However, he said he could not rule out the possibility of a "cavity" in the interior - something like a passage-tomb or maybe a cist grave. It would not have been uncommon for Bronze Age barrow to be built over a burial, which sometimes might be contained in a cist grave. This is basically a "box" consisting of large slabs of stone. 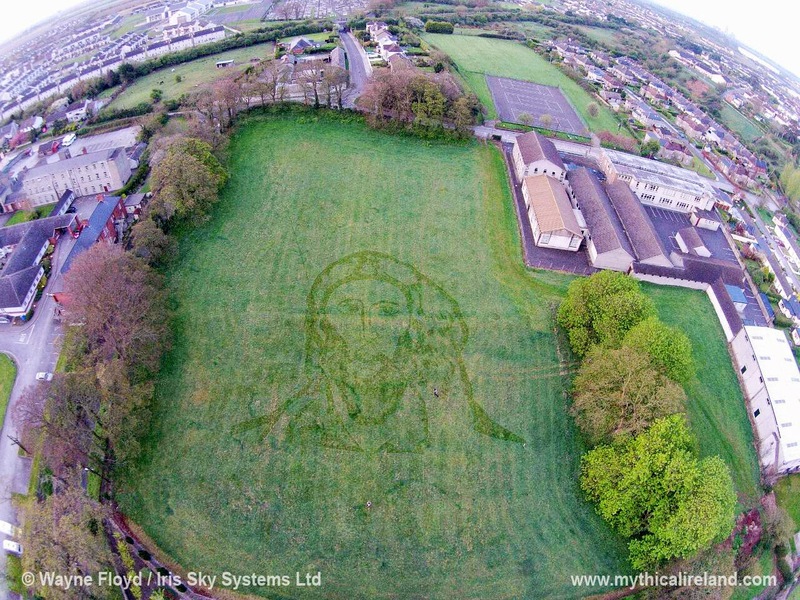 Community Historian Brendan Matthews suggested that a Bronze Age barrow-type mound might tie in with the mythology of the site, and that as the reputed burial place of Amergin, the figurehead of the Milesians who landed at the Boyne Estuary, a Bronze Age date might be more apt. 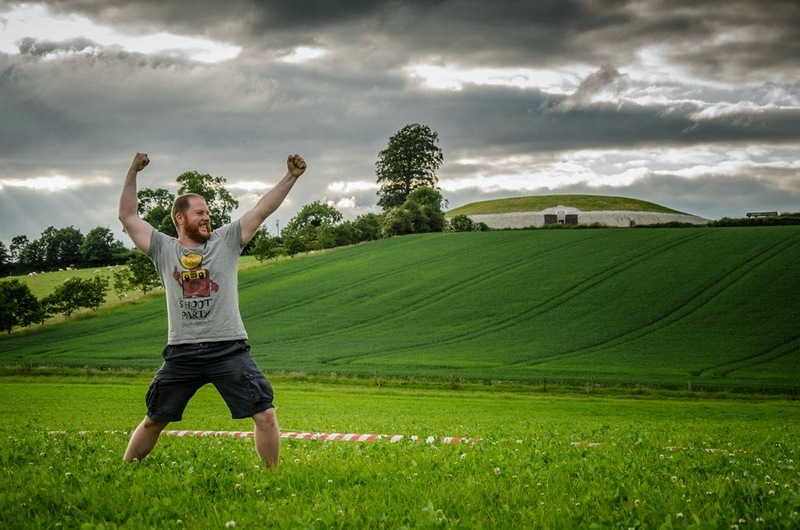 Earlier in the night, Conor Brady of DkIT gave an overview of the types of mounds found in Meath and Louth, including passage-tombs, barrows and a large number of unclassified mounds. Brendan Matthews revealed that a small section of what might have been an earlier revetment wall, set back some distance from the modern wall, was found during a recent "cleaning up" of the site. He also showed a photo of a stone-lined drain which was found near the top of the mound. Millmount as it looked in the 1740s, drawn by Thomas Wright. 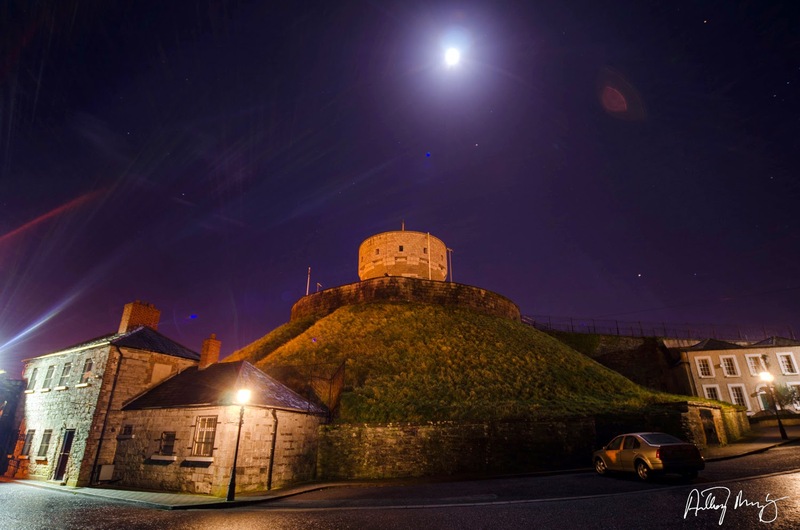 He revealed that no major modifications had taken place at Millmount from around 1672 until the British fortified the site and built the martello tower on top of the mound in 1807-8. But in the mid 1780s a ditch around the base of the mound was filled in, and local people used it for gardening! The presentation provoked a lot of questions from the audience, and there's no doubt it has focused minds on the possibility that Millmount is not a passage-tomb, and not, as suggested locally, contemporary with the great mounds of Brú na Bóinne. However, there have been several people who reported in the 20th century that they had been inside a tunnel under Millmount, and so it is obvious from contemporary accounts that there is at least one subterranean passageway in there. Whether this is part of a passage-tomb structure, or maybe a medieval souterrain, or even perhaps tunnels built linking the 17th century towers is a matter of conjecture right now. 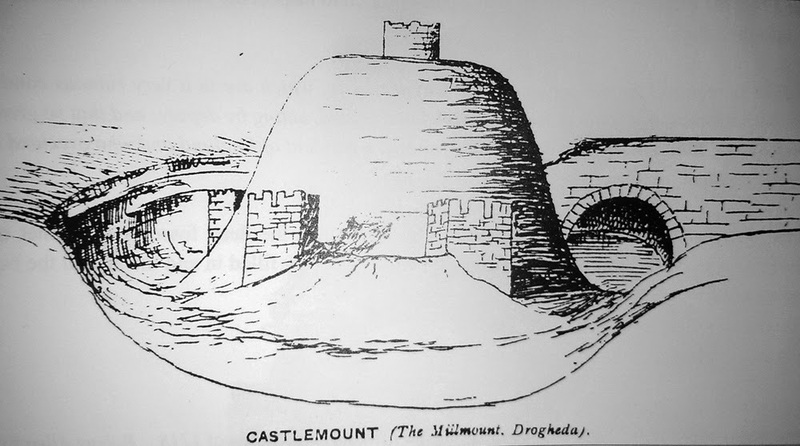 At this point, the Old Drogheda Society will be discussing the possibility of moving on to the next phase of the project, which involves a seismic technique that measures the response of sound waves through the monument. That could provide a more definitive overview of the mysterious mound of Millmount. Labels: aerial, camera, copter, drone, High Man, Newgrange, video, YouTube. 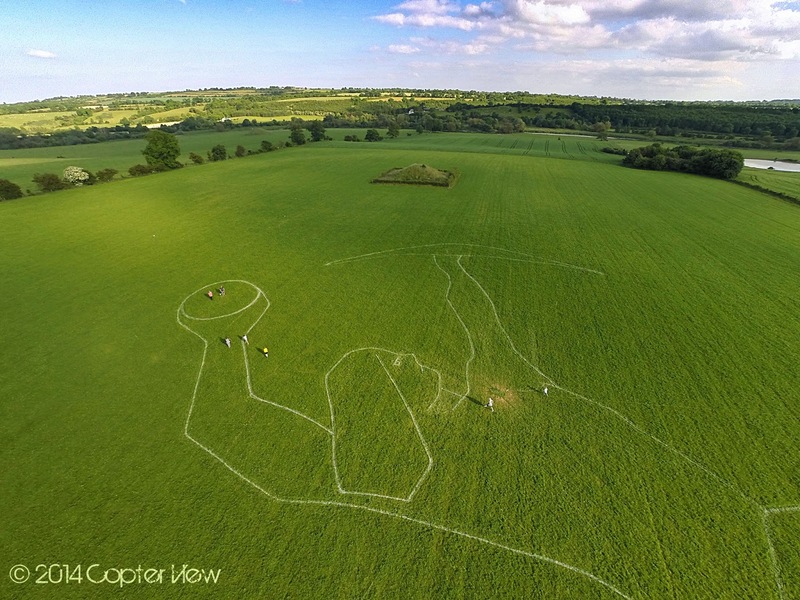 Richard Moore’s latest giant art installation will be completed today, on the summer solstice, in a field in front of Newgrange. 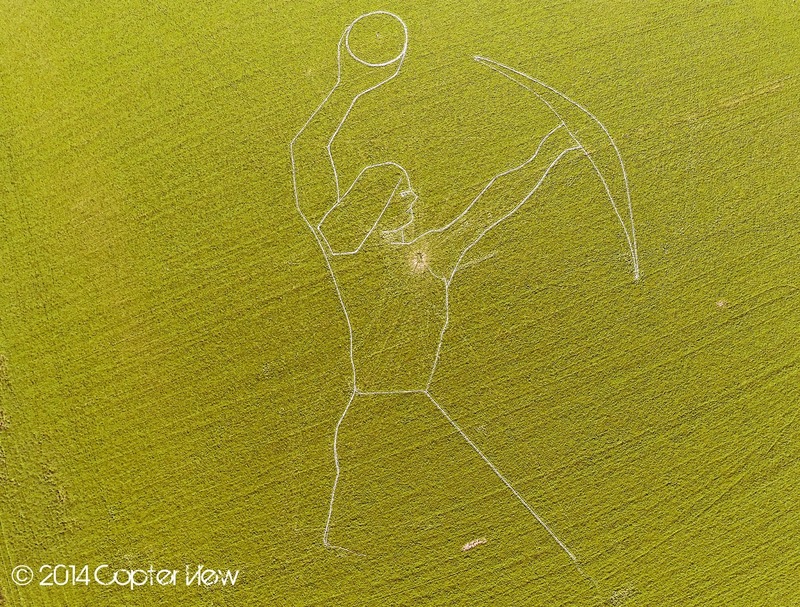 His new creation is the ‘High Man’, a giant warrior/god/hero holding the sun, based on Irish legends and the fact that in the sky, the huge hero constellation Orion appears to grab the sun on the longest day of the year. The High Man measures almost 150 metres tall (493 feet) and is situated in such a way that it reflects alignments concerning both winter solstice and summer solstice. 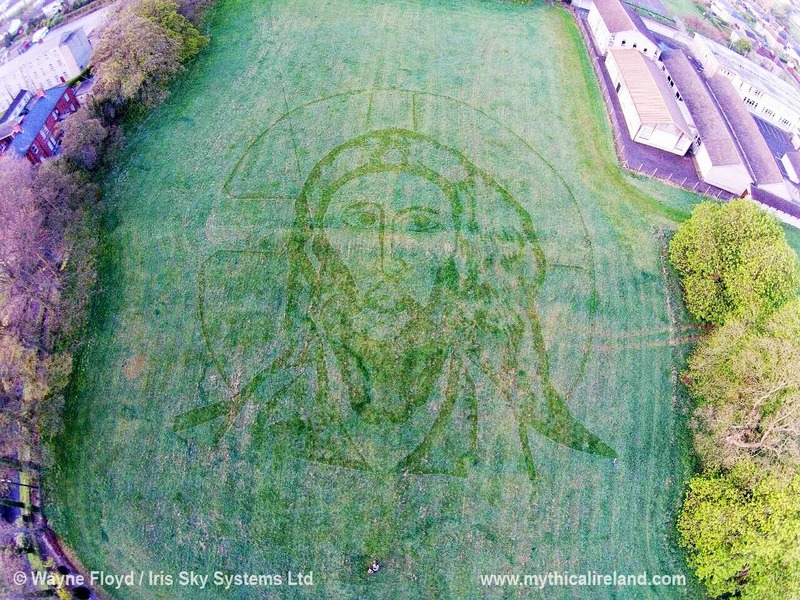 Richard shot to fame on Easter weekend when he created a huge Byzantine image of the face of Jesus in a field in Drogheda, helped by another local artist, Derek McCloskey. 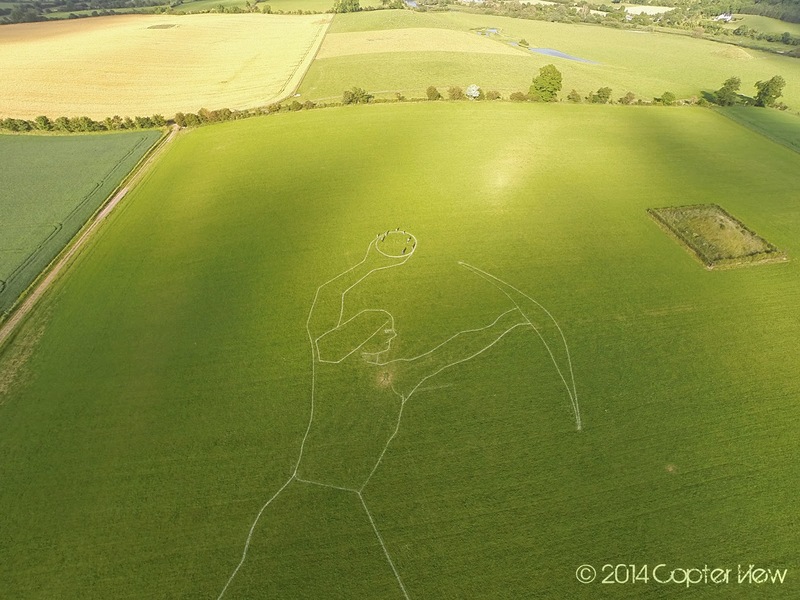 Now the pair have created an even larger image, but this time in the heart of the historic Boyne Valley. 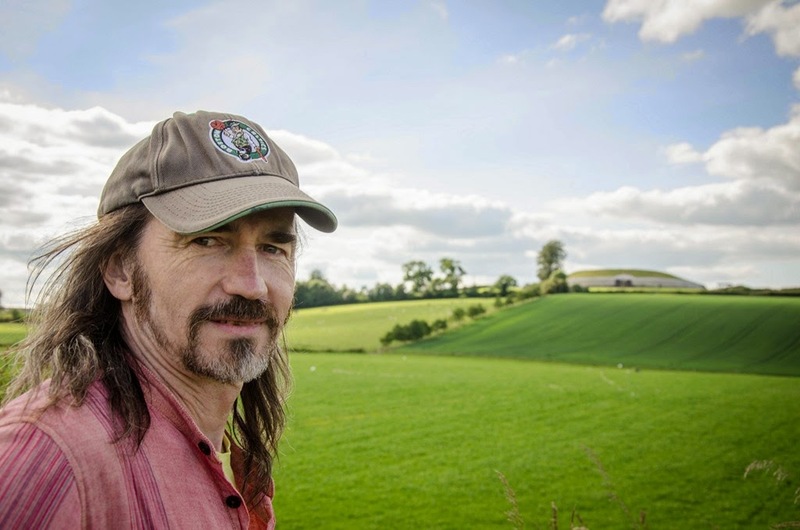 Artist Richard Moore at the site of the art near Newgrange. 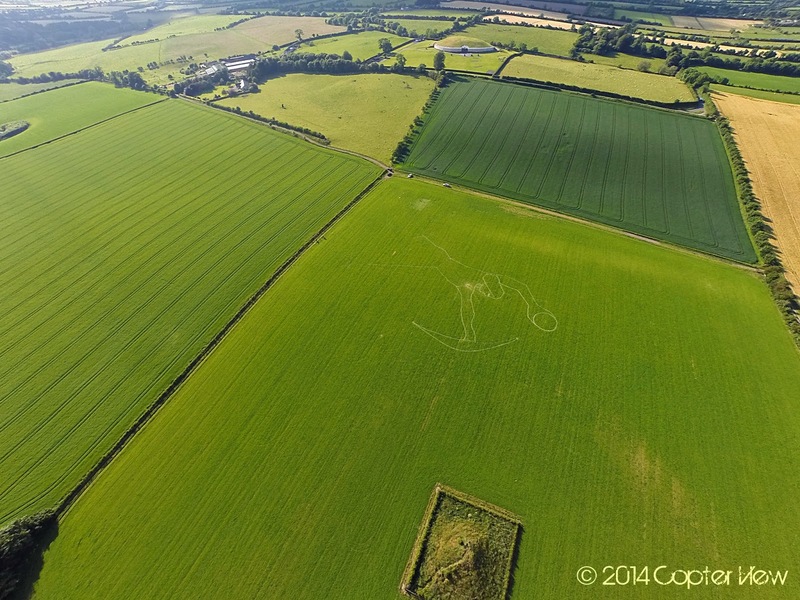 It’s based upon a giant warrior figure dubbed the ‘High Man’ which was discovered in the landscape of Louth and Meath by Moore and fellow author and researcher Anthony Murphy. 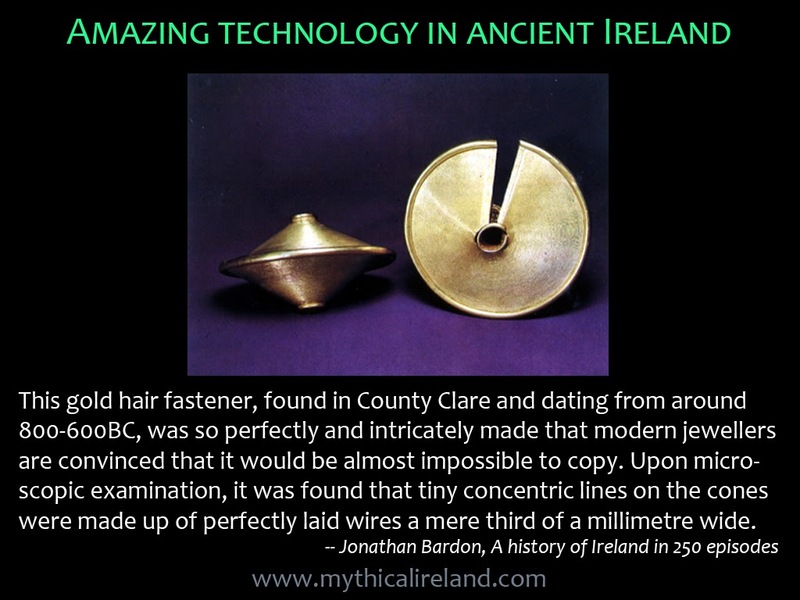 They wrote about it in their book ‘Island of the Setting Sun - In Search of Ireland’s Ancient Astronomers’. The giant heroic figure is located in an area anciently known as Ferrard - from Fer Ard, meaning ‘High Man’. This area stretches right down to the Boyne river, and so Newgrange, Knowth and Dowth were all in this ancient region. Midday on summer solstice - Orion holds the sun. image, demonstrates the pose of the High Man. Moore and Murphy are convinced that the builders of Newgrange were aware of this 26,000-year movement, known to astronomers today as the ‘Precession of the Equinoxes’. The pair say that the Stone Age builders were advanced astronomers and were also keen surveys, based largely around their comprehensive astronomical knowledge. The beauty of the new ‘High Man’ creation is that it is positioned in such a way as to reflect both summer solstice and winter solstice. 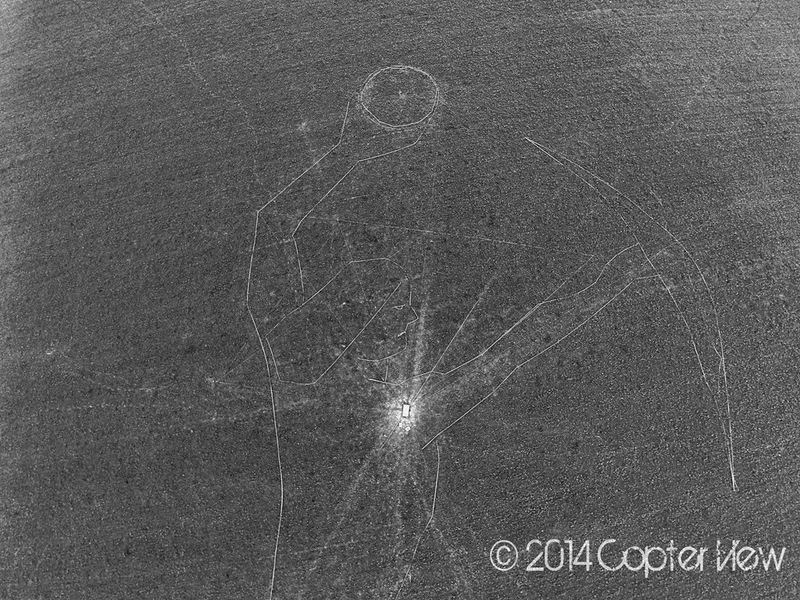 A close-up aerial view of part of the new High Man image. In addition to this, the figure itself is aligned to mark summer solstice. It is positioned so that it is pointing towards the place on the horizon where the sun rises on summer solstice. If you could darken the sky and see the stars, you would see the giant warrior constellation Orion appearing to ‘carry’ the sun through the sky. It’s quite remarkable,” said Richard. 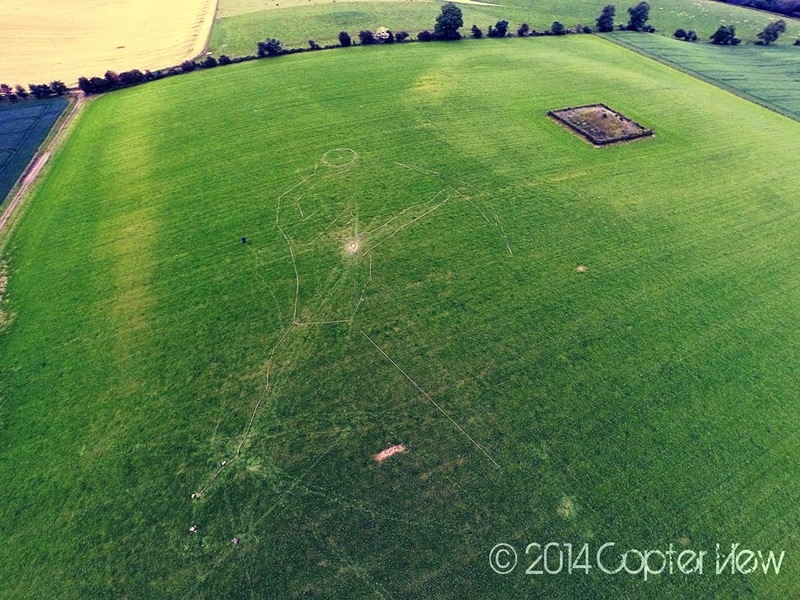 Richard Moore at work on the 'High Man' image near Newgrange. Could the moon's mountains be seen from ancient Ireland? The writings of Diodorus Siculus describe an island which many think was Ireland, inhabited by the Hyperborei, from which he said the moon appeared closer to the earth, and features like mountains could be seen. He also wrote that these inhabitants knew all about the 19-year cycle of the moon. Interesting stuff. You can hear me reading from Siculus and discussing the passage in the above video. Labels: Ballyboy Lake, book, Boyne Valley, Brigid's Way, bulletin, discovery, High Man, History Channel, Meath Folk Tales, new monument, News, pilgrimage, Richard Marsh, video, YouTube. 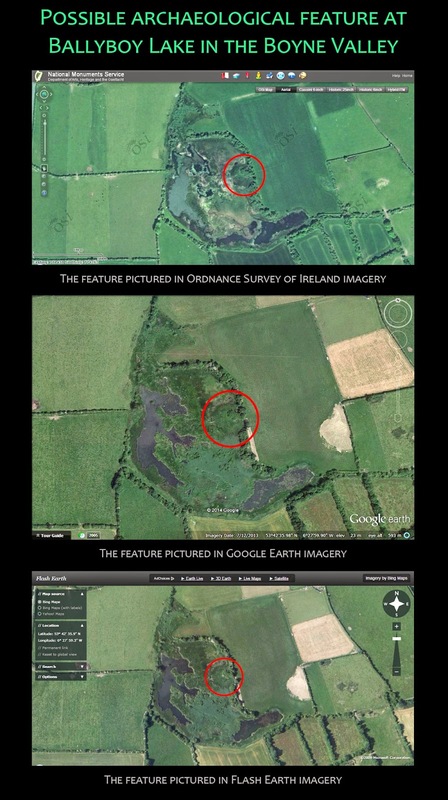 This is a series of images of the possible archaeological feature at Ballyboy Lake, near Dowth, in the Boyne Valley, as seen on Google Earth, Flash Earth and Ordnance Survey imagery. The circular feature may just be an optical peculiarity, or a vegetation feature. It certainly warrants further investigation. Might it be a crannóg - a lake dwelling, of which there are 1,200 known examples in Ireland? I have brought this feature to the attention of an archaeologist, who will hopefully be able to ascertain whether this might be a newly discovered archaeological monument. Of course, there's always the possibility that it's nothing . . . but we will wait and see. A short video about a circular feature that I discovered on Google Earth. 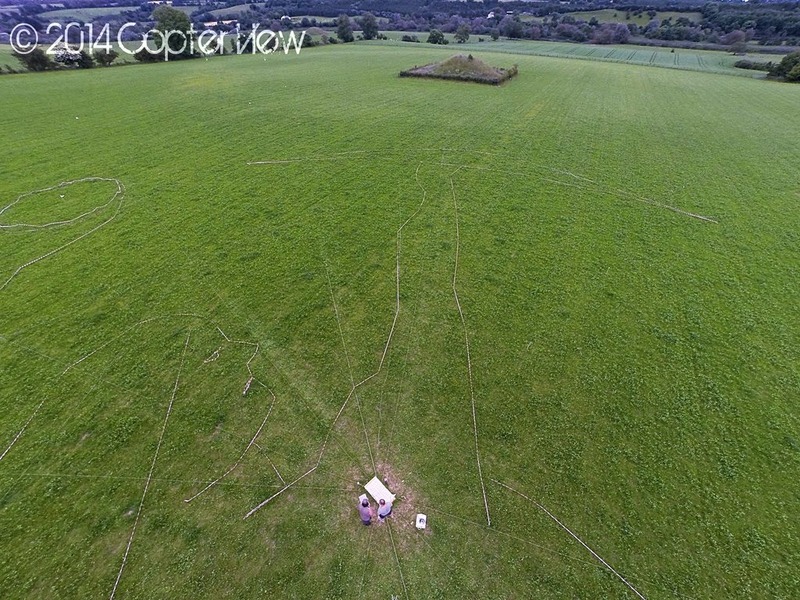 This is a quick look at three separate aerial/satellite images of the possible archaeological feature at Ballyboy Lake, near Dowth and Newgrange, in the Boyne Valley, Ireland. I initially spotted it using Google Earth, which is showing imagery taken in 2013. But the feature is also present in Ordnance Survey images and also on Microsoft's Flash Earth. The Google Earth and Flash Earth images look very similar, but were taken at different times of day, as you can see by the hedgerow/tree shadows. At the very least, this feature deserves further investigation. It might not be anything . . . but given that this is just 1.25km from Dowth and 1.8km from Newgrange, anything is possible. Might it be a crannóg? I have brought it to the attention of an archaeologist and hopefully someone will get to take a closer look and ascertain what it might be.